The Spanish firm Sylentis has developed a compound to treat diseases of the retina, such as age-related macular degeneration and diabetic retinopathy, which will be administered by ophthalmic drops instead of intraocular injections. The drug, which has been tested in animals, is a small interfering RNA capable of penetrating the cells of the retina and blocking the formation of new blood vessels. 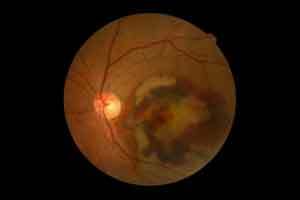 A new compound, developed by the biotechnology company Sylentis, is able to penetrate the retina to treat age-related macular degeneration and diabetic retinopathy, simply with the administration of ophthalmic drops. The drug SYL136001v10, presented by the PharmaMar group company, is still in the preclinical phase. “Its effectiveness has been proven in animal models and trials with humans will begin at the end of 2018”, said Covadonga Pañeda, R+D Manager at Sylentis. Pañeda is the main author of a study on SYL136001v10, which was presented at the end of September at the XIII Annual Meeting of the Oligonucleotides Therapeutics Society, held in Bordeaux (France). Pañeda goes on to explain that this compound “is a small interfering RNA (siRNA) designed to silence the expression of NRARP, a protein that controls the formation of new blood vessels in the retina”. In this way, she says, “the drug exerts its action by entering the cells of the retina, where it prevents the synthesis of this protein and blocks the formation of new vessels, which is one of the fundamental characteristics of degenerative diseases of the retina”. Therefore, “patients suffering from age-related macular degeneration or diabetic retinopathy have to go to the hospital where the treatments are performed with ocular injections, which is annoying and painful and also involves a significant financial investment for the health system”, says Covadonga Pañeda. However, she notes, “siRNA, like SYL136001v10, are up to 10 times smaller than these treatments. Their size allows them to penetrate the retina and inhibit the formation of new blood vessels after their application in ophthalmic drops, as we have shown in animal models”. In particular, “efficacy studies have shown that the reduction of NRARP in the retina by means of siRNA leads to the regression of angiogenic retinal lesions and that the observed reductions are equivalent to those of anti-VEGF, which is the current treatment standard for these diseases with ocular injections”, stresses the R&D manager. Something revolutionary!!! Waiting for human trials.